Last week NSW Government, led by Mike Baird passed new ‘anti-protest’ legislation increasing penalties for protesters at mining and coal-seam gas sites and awarding police greater discretionary powers to use their ‘move on’ orders to disperse and disband protest groups. As a citizen of NSW I’d say its about the clearest indication we’ve been given to date about just whose rights our ‘democratically elected’ government chooses to protect. It’s certainly not us. As far as they’re concerned we can all return to our poisoned waterholes and shut the ‘f’ up. And thanks to the provision of electricity from aforementioned sites, our lights will be on so while we might be contaminated with heavy metals, at least we’ll be able to see our children bleeding from the ears and nose in full fluorescent glory. Thanks to Baird’s new legislation, it’s clear that in NSW, it’s Corporations before citizens. Particularly if those same unvalued citizens appear to be questioning the integrity of a corporation, and impeding it’s ability to turn a profit. Last time I queued for the polling booth, corporations didn’t vote. They can’t hold a pencil. Our elected government were voted by the people. And not just rich people. Poor people. Smart people. Dumb people. Happy people. Angry people. I may be an idealist, but as far as I understood it, one vote equals one vote as we are supposed to be shareholders in a shared outcome. So why then are the shareholders of multi-national corporations enjoying the privilege of legislation to protect their interests? If democracy means a government by the people, where the supreme power is vested in the people and then exercised by them directly or indirectly through a system of representation, then in keeping with that I would expect the government to serve the interests of the people above the interests of big business. Isn’t that the point of having a democratically elected government? Big business are not ‘the people’. But no, protesters continue to be vilified as social harm. Even the peaceful ones. Are the Knitting Nannas really that scary? Could they send a knitting Nanna to jail for seven years because she’d pearled the police force into a corner? The police, as public servants are paid by the tax dollar and in my opinion they are there to protect the interests of the people. People like the Nannas. Not the corporations. Corporations can afford to protect themselves. Why do the police end up working for them? I mean in QLD the police have used a Santos Logo on their uniform! What’s next- an entire force sponsored by McDonalds? And before you start bellowing ‘corporations pay tax’. At least 1/3 of them don’t. According to figures released by the ATO we lose in excess of $8.4 billion dollars a year in corporate tax. Maybe we should start jailing them for 7 years instead? Mr Baird defends his position by saying ‘peaceful protests are fine’. But what does he define as a peaceful protest? A toddler in a Sea Shepherd shirt? A person clicking YES on an online petition? What about a peaceful person blocking an access gate? Sorry, that’s trespass. Trespass is considered non peaceful Action. That’s were the Police will now come in. Interestingly the point being hammered home for the State government’s PR agenda is ‘risk.’ Mike ‘I have gas’ Baird says the laws are meant to target ‘Those who decide to protest and put not only their lives at risk, but worker’s lives at risk and interrupt businesses that are going about their day to day life.’ Since you bought ‘risk’ up Mr Baird. I’d wonder how you’d care to define it? What if your inability to protect your citizens from the significant harms caused by activities like CSG caused severe health problems for communities in their wake, who then went on to experience personal harm, loss of business and loss of natural amenity and resource? Isn’t killing off communities for gas a ‘risk’ as well? If you fine and incarcerate Nannas shouldn’t you also be fining and incarcerating mining companies? When Santos failed to report a spill in the Pilliga State Forest, the Land and Environment Court awarded a $52 000 fine. The maximum penalty is $1million. 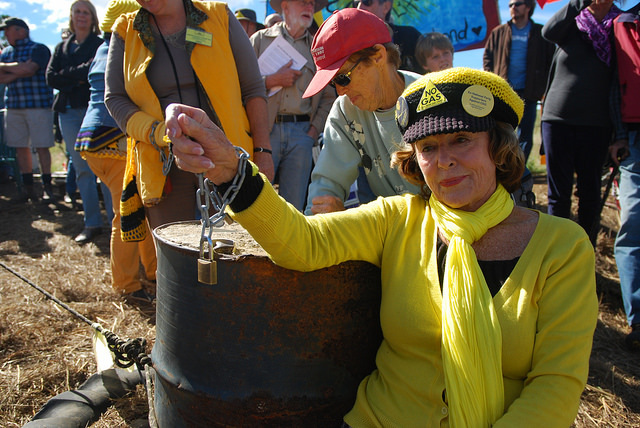 Since then $17 million has been spent on rehabilitation in the Pilliga and it’s not working. Trees are still dying. Isn’t that a significant long term harm to the people of NSW? I guess not. Perhaps it’s an Orwellian future we face where ‘all risks are equal, but some are more equal than others.’ Especially when those risks affect profit. Why don’t we just give up on this facade of democratically elected representation, and accept we’re voting for corporations. Instead of voting LIberal or Labour, maybe we should choose between Santos or Metgasco, Coke or Pepsi, Coles or Woolies.